We are still locked in those cold days of winter so we need something comforting and warming. 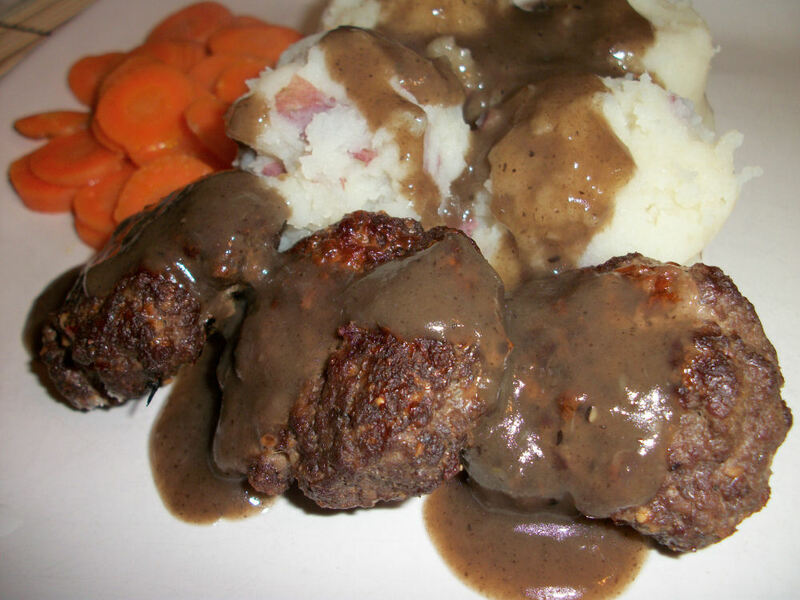 I always shake my head when I see those frozen entree salisbury steak dinners. We can do so much better with just a bit of prep. You can even form these patties ahead of time, refrigerate or freeze them (as long as you started with fresh meat ofcourse). You could get this dish on the table in the time it takes to make one of those frozen dinners in the oven. Hehe, I can’t compete with the microwave. Want to know something interesting, they eat this in Japan. It is that international a dish, although out there they call it Hanbagu. I just like saying it, it makes me feel very engrish. Hanbagu is awesome! Fear the hanbagu! We love you hanbagu! Combine the beef, garlic, worcestershire sauce and montreal steak spice in a bowl. Form the mixture into small patties and set aside. Heat a pan to medium. Spray and add onions and mushrooms, cook until desired doneness, remove from pan. If you like a chunky gravy just set them aside. If you prefer a smoother gravy puree these with the water and set aside. Add the patties to the pan and sear on each side. Traditionally, you will finish cooking these in your gravy. If you are doing these remove them and set aside. If not, then cook until done. While the patties are searing or cooking. Add the cornstarch, oxo and butter to a small pot. Allow the butter to melt and stir to combine with the dry ingredient. Add the water or puree slowly, whisking the whole time to avoid lumps. Bring the sauce to a boil. If you had the onions and mushrooms set aside add them now. If you are cooking the patties in the sauce place them in your gravy now and allow to simmer covered for 20-30 minutes. If you opted for the cooked patties serve the sauce over the patties and enjoy! Serves 4. Each serving of patties and mushroom gravy contains 291 calories, 18 grams of fat and 1.1 grams of fibre. Definitely one of those comfort foods, it may be low in calories but the fat is something you don’t want to do everyday. Tasty with rustic mashed potatoes (especially those royal mashed potatoes) and some cooked carrots. This entry was posted in Comfort Foods, Dinner and tagged Beef, Garlic, mushroom, Onion, sauce. Bookmark the permalink.